Lake-effect snow continues to pound the metro Buffalo area and the Southtown with snow falling at a rate of 1 to 2 inches per hour this afternoon, weather forecasters said. It's going to make for a nasty commute home. Travel bans are in effect in Alden, Aurora, Boston, Brant, Eden, Elma, Evans, Hamburg, Marilla, North Collins and Orchard Park and all villages within those towns. Genesee County also has a travel ban in effect. In the meantime, Erie County is under a state of emergency. Mayor Byron W. Brown also declared a state of emergency. Route 5 was closed, including the Skyway, from Ridge Road to Interstate-190. Tractor trailers and commercial buses are banned from major state routes including the Thruway. Numerous accidents have been reported throughout the Southtowns today. The Niagara County Sheriff's Office also issued a travel advisory until further notice, "a strong suggestion but not a ban" on unnecessary travel, its press release said. Niagara County government is closed except for essential personnel in law enforcement, public works and water/sewer. Currently there are two bands of lake-effect snow coming off Lake Erie: one over metro Buffalo and the other, a bigger, more potent one, over the Southtowns extending from the Pennsylvania line, across the Boston Hills and into the far northwest corner of Wyoming County. The bands are converging over Genesee County where they’re causing white-out conditions. 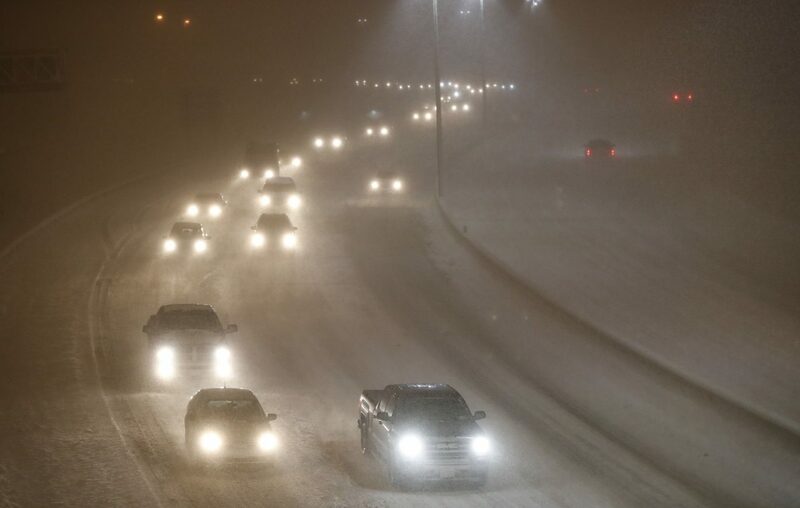 Lake-effect storms have a tendency to hit “peak intensity” during the evening hours, said Dave Zaff, a meteorologist with the National Weather Service office in Buffalo. At the same time, the bitter cold is getting worse. “It’s going to continue to drop below zero,” Zaff said. He recommended staying off the roads until at least the blizzard warning expires at 1 a.m.
“We don’t recommend travel,” he said. As for folks headed home from downtown this afternoon? “We're kind of recommending not commuting,” Zaff said. Public works officials also urged people to heed travel bans – and stay off the roads even in places where less-stringent travel advisories were in place. "If you don't need to be out on the roadway, you shouldn't be," said Buffalo Public Works Commissioner Steven Stepniak Wednesday morning. "With dangerous wind chills and you get stuck, that's a bad situation. If you don't need to be out on the roadway, stay at home." In Buffalo, more than 50 sanitation crews were out plowing through the night and into the morning, focusing mostly on main roadways, Stepniak said. The state sent six pieces of equipment to help. Crews were mostly out on the West Side and the northern half of Buffalo where most of the snow fell overnight, Stepniak said. "We're looking at just over a foot in those areas," Stepniak said. City officials reminded residents that garbage and recycling pickup has been canceled for Wednesday and Thursday. Niagara Falls and Lockport also canceled sanitation pickup Wednesday as have several other towns and villages.